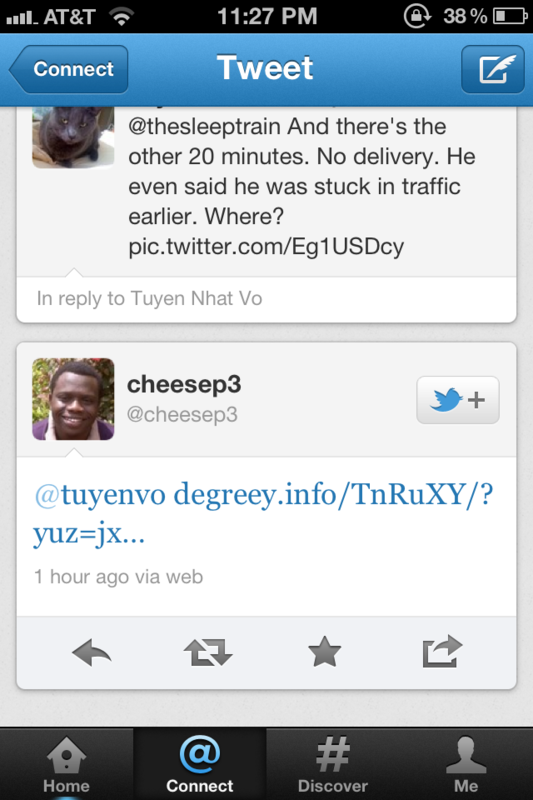 Thinking someone was replying to my rant about Sleep Train, I clicked on the link and got this. Oh Internet! You never fail to put me in my place. Twitter feed back to private. I'm currently working on a new iPhone app and starting to understand how difficult it is to build something that is both good looking and also simple to understand/use. There are so many small nuances to consider since there isn't a lot of real estate with which to get your point across. One of the most maddening things to get right are icons. People don't realize how difficult it is to build great looking icons from scratch. There are only a handful of apps that I consider beautiful and even among those, I have issues with the icons. After revision after revision of icons from my designer, I started to scour the web for examples of good icons. To my chagrin, the answer was staring me right in the face - Glyphish. Here was an extensive set of beautifully designed icons that are so simple and yet so clear in what the icon is supposed to represent. How good are these icons? They're used by little known companies like Google, Twitter, and a small phone manufacturer called Apple. The best part of it? $25 for a full pro license that doesn't require attribution and can be used in an unlimited number of projects (free version requires attribution, doesn't include Retina Display version of icons). I've seen icon sets costing four times as much that are no where near as clean and well designed. Kudos to Joseph Wain for creating these and providing them at a ridiculously cheap price. Oh, and his $10 set of background images are well worth it, too! 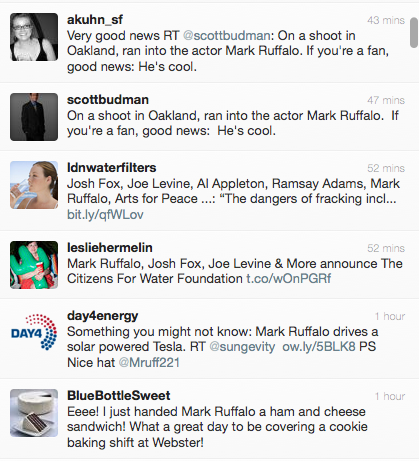 As you can see, the 5th result down mentioned Mark Ruffalo and Sungevity, a solar startup down the street. Clicked on the link and BAM!, Mark Ruffalo sitting in a Tesla Roadster wearing a Sungevity hat. Looks like he was in the area not to shoot a movie but to pop into Sungevity for something or other. This brings up my second instance where Twitter succeeded where Google (and other methods) failed to solve a problem/query. Over the July 4th holiday, I wanted to know if Blue Bottle was open on Monday, the 4th. Calling their number didn't help because it was a standard phone greeting offering hours of service during normal weeks but not holidays. Same for their website and any search I did about Blue Bottle and the 4th of July yielded no mention of hours. I then went over to Twitter and found Blue Bottle's account and BAM!, there you go. Now these are just two specific instances and of course, I still do most of my general search on Google but it's been a long time since I last found the answer to a query outside of Google. It's a death by a thousand cuts for them as Facebook, Twitter, and others start chipping away at their defenses. Google looked unassailable, much like Microsoft 10-15 years ago. Today, there's only one product of Microsoft's that I use, Office. I've switched from Windows to Mac for my hardware, Windows Mobile to iPhone for my cell, and even Exchange to Google Apps for my businesses. The endless cycle of rise and fall in tech is unrelenting and no one is immune. No words can explain it. You have to view his Twitter responses on the right hand side. My 2 cents regarding why teens don't use Twitter. Plus why I'm the worst customer for Facebook. A few articles came out today re: why teens don't use Twitter. You can read the articles for yourself and I think they raise some valid points. Most of the folks I follow (and who follow me) on Twitter are people of my age group or older. I only have a handful of people in their teens or early 20's category who I follow and vice versa - all of which are family. My own humble opinion on why teens don't use Twitter? They just don't have the bandwidth (mental not data) to deal with yet another social network. Facebook (and before them MySpace) came on the scene before Twitter and people jumped in and love it. I know people who spend hours a day on Facebook. Adding another social networking site that somewhat does the same thing is just extraneous. Now, for the second part regarding why I think I'm the worst customer for Facebook. I post to Facebook often via Posterous. That means I'm posting updates, pictures, videos, etc. However, I rarely actually go to Facebook (about once a month, maybe). All that media takes up space and when people view it, that takes up bandwidth. 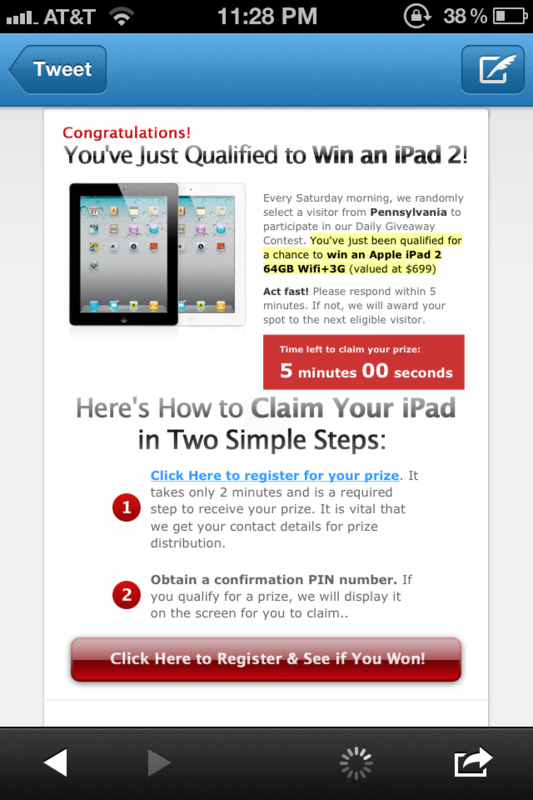 But I've never clicked on a Facebook ad once and it's probably looking like I won't any time soon. I don't "interact" with the service in a way that might derive revenue for them. Who knows, maybe they've baked people like me into their model but I'm sure they would prefer it if I was spending more time on the site itself.